Free and paid cyber security services. Security assessment, vulnerability scanning, penetration testing and other services. We provide the following services, some of which are unique or rare in the market: Vulnerability Scanning, Penetration Testing (Pentests), Automated and Manual Security Analysis of Software Source Code, ISO 27001 and PCI DSS Implementation, Application Security, Software Engineering, Security Team Extension (outsourcing and outstaffing), GDPR compliance and other services. Select the service you are interested in. Automated black-box website security assessment. Prompt result. Different scan modes, depth and quality. Choose free-of-charge on-demand testing or cheap subscription to continuous monitoring. Learn more. Manual vulnerability scanning with commercial scanners: Acunetix, BurpSuite Pro, Qualys, Nexpose. Limited reporting: the summary and raw scanner reports. The minimum order includes a simple website or service (up to 20 pages and 2 forms), or 16 IP addresses, takes 2 to 3 days and is $15 per IP address for the networks (Qualys + Nexpose) or $180 per website or service (Acunetix + BurpSuite Pro). Details. Manual and automated security assessment of websites, networks, applications, etc. Optional DoS/DDoS, social engineering tests and reverse engineering. Vulnerability verification and exploitation. Project planning, risk assessment, remediation recommendations and reporting. Vulnerability mitigation assistance and retest after mitigation. Express Pentest is from $150 per IP address or $1500 per simple website or service (up to 20 pages and 2 forms). Details. * Subscribe for 12 months and get 4 quarterly security assessments with 10% discount. What's next? Compare services in detail. Customize your request. Learn more about pentest process and results. Dura­tion Scan: 5 min - 2+ hours. Monitor: 54 $ per month 15 USD per IP address. 180 USD per web­site 150 USD per IP address. External or internal wired or wireless network or infrastructure pentest. White-box security assessment or security review of source code of website, web application. White-box security assessment or security review of source code of Unix/Linux, Windows, iOS, Android application. Personnel pentest (social engineering methods). Managed compliance with ISO 27001, PCI DSS, HIPAA, GDPR, etc. Training, workshop on secure software development, social engineering, etc. We sign your Non-Disclosure Agreement and commit to confidentiality. You answer our questions about the conditions and environment to help us define your requirements and expectations. We analyze your input and develop the Rules of Engagement (RoE) and the project plan. We send you detailed commercial proposal, including Rules of Engagement and project plan. These documents define all detailed conditions and parameters of the penetration test. You accept our proposal and approve the documents. Then you and we sign the Service Agreement. Passive pentest phase begins with Open-Source Intelligence (OSINT). Active pentest phase includes vulnerability identification, verification, exploitation and evidence collection. Then we assess risks of each found vulnerability and develop recommendations on vulnerability mitigation and continuous improvement. 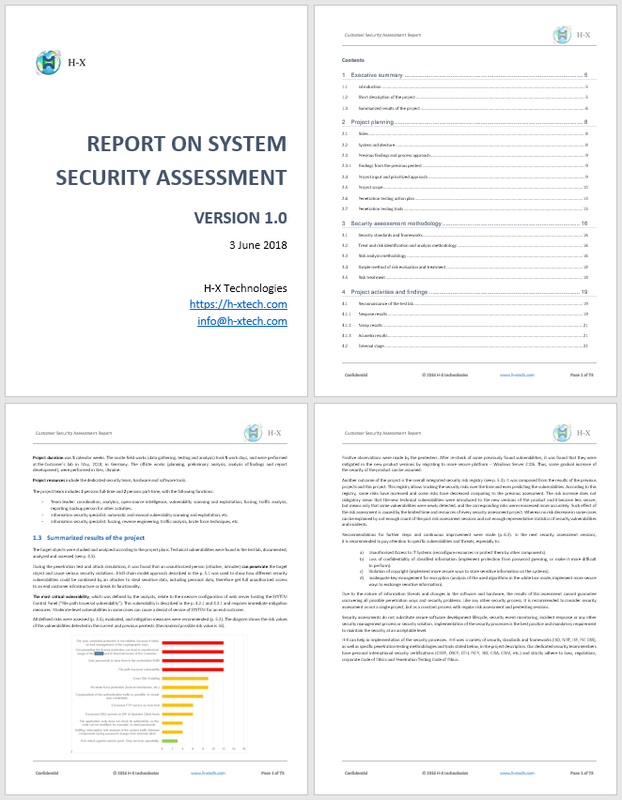 The Security Assessment Report describes the findings and what should be done to improve your security. We consult on vulnerability mitigation and perform a retest on demand. The project is completed. Security Assessment Report includes all project deliverables. Simple report structure is described below. Depending on the pentest requirements, conditions, restrictions and parameters, the report can include more additional sections. Identified vulnerabilities and their exploitation ways. Details and evidences (logs, dumps, screenshots, etc.). Recommended security measures, grouped and prioritized. Go top, choose pentest type and order. Who we are, what we do, and what partnership we offer.